Frieze Spotlight Section is dedicated to presenting rare solo presentations of significant but under-recognised 20th-century artists. Few artists fit that description better than Li Yuan-chia (1924-1994), one of China's earliest pioneers of abstract and conceptual art. 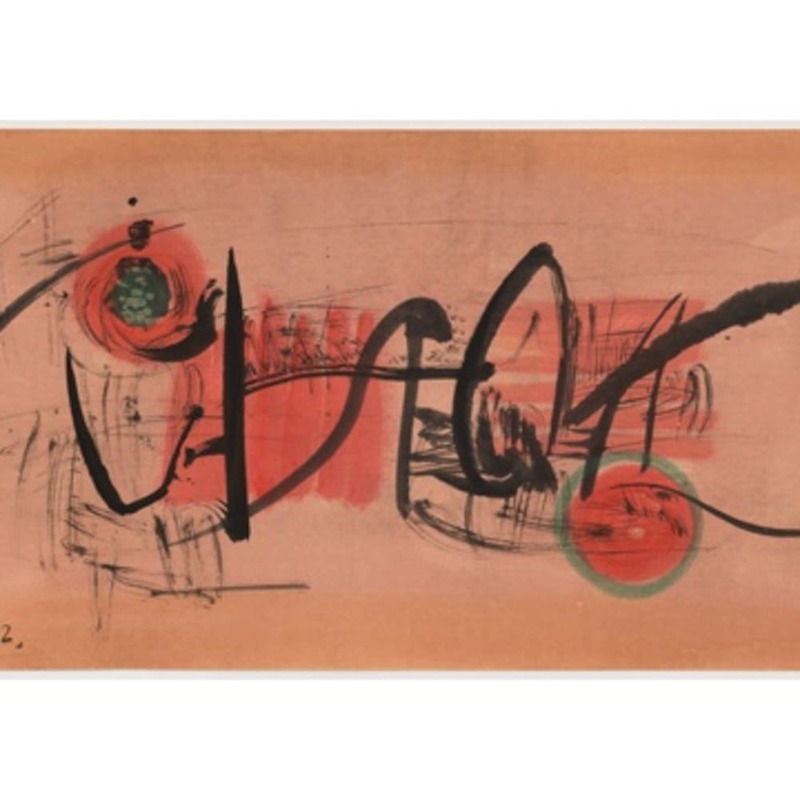 To pursue his artistic vision Li had to leave Taiwan: engaging with the practices of western artists in both Italy and England, he developed a unique style combining traditional Chinese calligraphy with abstraction. A founding member of the illustrious Ton Fan Group, and known as one of the "8 Great Outlaws", Li rebelled against the traditional art methods and practices of Taiwan and China and became actively engaged in the International art world. Li's focus on the spirit of Chinese culture and philosophy, combined with an experimental aesthetic has resulted in a distinctive oeuvre, spanning painting, photography, sculpture and participatory kinetic installations. To coincide with their Frieze Spotlight exhibition Richard Saltoun Gallery will simultaneously hold a retrospective exhibition dedicated to Li Yuan-chia at their gallery in Great Titchfield Street, London W1. The exhibition at Richard Saltoun Gallery is curated by renowned scholar Diana Yeh, and will provide a comprehensive overview of Li's work. These exhibitions coincide with Li's work on show in the current rehang of Tate Modern. Richard Saltoun would like to thank the Li Yuan-chia Foundation and their archivists for their support and guidance, as well as the Gavina Family, Italy. Read recent press on Li Yuan-chia: 'Discovering the unsung heroes of Chinese art' (The Telegraph). Li Yuan-chia was born into a peasant family in rural Guangxi Province. Given up for adoption at the age of 11, his adoptive father was killed in the Sino-Japanese War, and he was subsequently raised in a succession of orphanages in China. From these unpromising beginnings, he forged a career as an artist in Taiwan, Italy, London and, for the latter part of his life, Cumbria in the North of England. Li's unique artistic vision fused disparate cultures and philosophies to produce works that spoke to different cultures and cut across geographical boundaries. He integrated Eastern philosophy with Western materials, merging art into his daily life and combining Taoism with the poetry of visual art. Fascinated by the pursuit of the beginning of all things and using only four colours (white for purity, black for the origin and the end of all things, red for blood and life, gold for nobility), Li developed a distinctive visual language, which represented the symbolic image of the universe. Li Yuan-Chia's early career was defined by his response to Taiwan's introduction of martial law in 1957; forming, along with other artists and intellectuals, the Ton Fan Group. Making the first abstract art in Taiwan as a protest against repression, the Ton Fan Group was recognized internationally and they were invited to present their work at the Fourth São Paulo Biennial (1957). At the request of Hsiao Chin (another member of the Ton Fan group), Li was invited to move to Bologna, Italy, and arrived in 1961/1962 under the sponsorship of Italian furniture designer Dino Gavina. Li and Hsiao were active in the formation of the Milan-based Il Punto Group with Antonio Calderara, Dadamaino, and Kenjiro Azuma - a group which seamlessly merged Eastern and Western art. Artist David Medalla, a founder of London's leading experimental art space Signals, saw Li's work in a Zurich gallery brochure and invited him to London in 1965. Li's exhibitions at Signal's Gallery led to three solo exhibitions at Lisson Gallery but ultimately the city could not satisfy him. Li settled in Cumbria, where, with his extraordinary energy he converted a hundred-year-old farmhouse near Hadrian's Wall into the LYC Museum and Art Gallery, a landmark cultural centre in an historic part of England. The museum opened in 1972 and exhibited more than 330 artists, including Hans Hartung, Antonio Calderara, Takis and J.R. Soto. The LYC is considered Li's greatest artwork and closed in 1983. Li Yuan-chia died of cancer in 1994, aged just 65. In 2001 the Camden Arts Centre in London gave him a solo exhibition, and in 2014 a major retrospective took place at the Taipei Fine Arts Museum, Taiwan with a corresponding one-room display at Tate Modern. Selected Solo exhibitions: Tate Modern, London, 2014 - 2015; Taipei Fine Arts Museum, Taiwan, 2014; Camden Arts Centre, London, 2001 (touring Abbot Hall Art Gallery, Kendal, Cumbria, and Palais des Beaux-Arts, Brussels, 2001), Water + Colour = 56/7 = Li Yuan-chia, LYC Museum (Banks, Cumbria, 1977), Golden Moon Show, Lisson Gallery (London, 1969), Cosmic Multiples, Lisson Gallery (London, 1968), Cosmic Point, Lisson Gallery (London, 1967), All or Nothing Show, Speakers' Corner, Hyde Park (London, 1967). Diana Yeh is a Lecturer in Sociology, Culture and the Creative Industries at City, University of London and a Trustee of the LYC Foundation. She has undertaken several years of fieldwork on Li Yuan-chia, tracing his life and artistic work from London, Cumbria, Bologna and Taipei to Guangxi and has published widely on him. She is also author of The Happy Hsiungs: Performing China and the Struggle for Modernity (2014) and is currently writing a book arising from her research on Li and other Chinese diaspora artists in the UK.